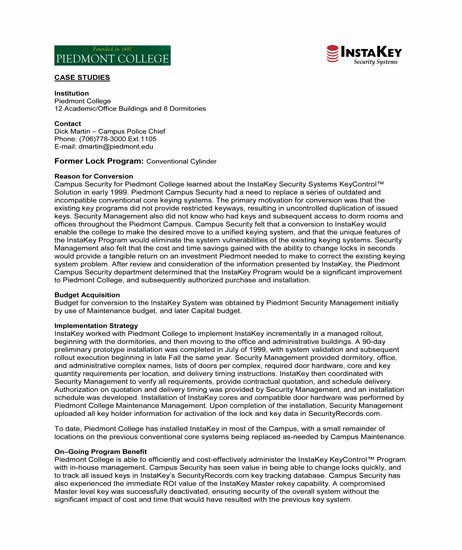 Campus Security for Piedmont College learned about the InstaKey Security Systems Key Control Solution in early 1999. Piedmont Campus Security had a need to replace a series of outdated and incompatible conventional core keying systems. The primary motivation for conversion was that the existing key programs did not provide restricted keyways, resulting in uncontrolled duplication of issued keys. Security Management also did not know who had keys and subsequent access to dorm rooms and offices throughout the Piedmont Campus. Campus Security felt that a conversion to InstaKey would enable the college to make the desired move to a unified keying system, and that the unique features of the InstaKey Program would eliminate the system vulnerabilities of the existing keying systems. Security Management also felt that the cost and time savings gained with the ability to change locks in seconds would provide a tangible return on an investment Piedmont needed to make to correct the existing keying system problem. After review and consideration of the information presented by InstaKey, the Piedmont Campus Security department determined that the InstaKey Program would be a significant improvement to Piedmont College, and subsequently authorized purchase and installation.